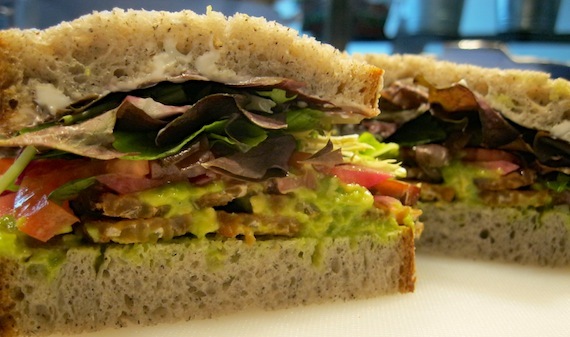 this week our favorite sandwich shop in town, mendocino farms, has a vegan club on special and it looks scrumptious! we’re already in love with the soyrizo wrap and vegan shawarma at mendo, so we can’t wait to check the club out. let’s see how it stacks up against the current champion of the club club. go give this sandwich a try at any of the mendocino locations and let us know what you think! – Rustic White = Vegan! – Sensitive Baker’s Gluten Free Bread = Vegan! Don’t forget the Singaporean Doca Wrap at Mendocino farms, it’s a must try! Vegan coconut curried cauliflower mash with garbanzo beans, tamarind chutney, red onions, spinach… divine! Had it for dinner tonight. Not bad. I got extra veganiase, cause that just makes everything better. They have 4 vegan sandwiches now! They had a special Indian chickpea sandwich for a monthly special once which was AWESOME. AND they are coming to West Hollywood soon!